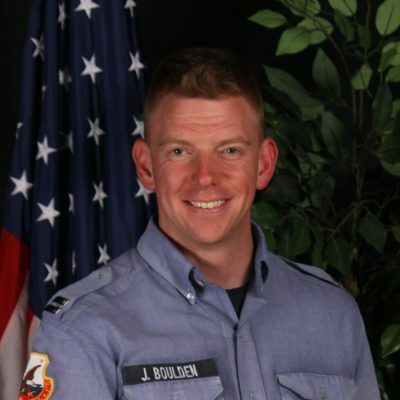 Jesse Boulden was introduced to the ALERT program in 1998, and from then on he knew that it was something he wanted to pursue. He completed ALERT Basic Training 10 years later with Unit 40, in the fall of 2008. He went on to go through Emergency Response Training (ERT), and took EMT and Leadership as his third phase options. After graduating from the program in 2009 he returned on a volunteer status and worked as a Squad Leader in Basic Training, as well as spending 3 months with the Mobile Ministry Team (MMT). He went on to serve as a Drill Instructor for a year, the Senior Drill Instructor for two years, and the ALERT Sergeant Major for a year and a half. After completing his 6-year stint as an enlisted man at ALERT, he was commissioned as an officer and now works as the Basic Training Commanding Officer, as well as a primary instructor for the Phase III Leadership & Communication class. Capt. Boulden’s desire in working with ALERT is to see men come to an understanding of what it means to be a man fully committed to the cause of Christ – to train them to be well-rounded, confident, competent, culture-changing men of God.